An example of the social “get out the vote” message shown to more than 60 million Facebook users on U.S. Election Day 2010. Other users in the study saw an informational message – identical in all respects except for pictures of friends. A control group received no Election Day message from Facebook at all. Click image for larger view. About one third of a million more people showed up at the ballot box in the United States in 2010 because of a single Facebook message on Election Day, estimates a new study led by the University of California, San Diego. 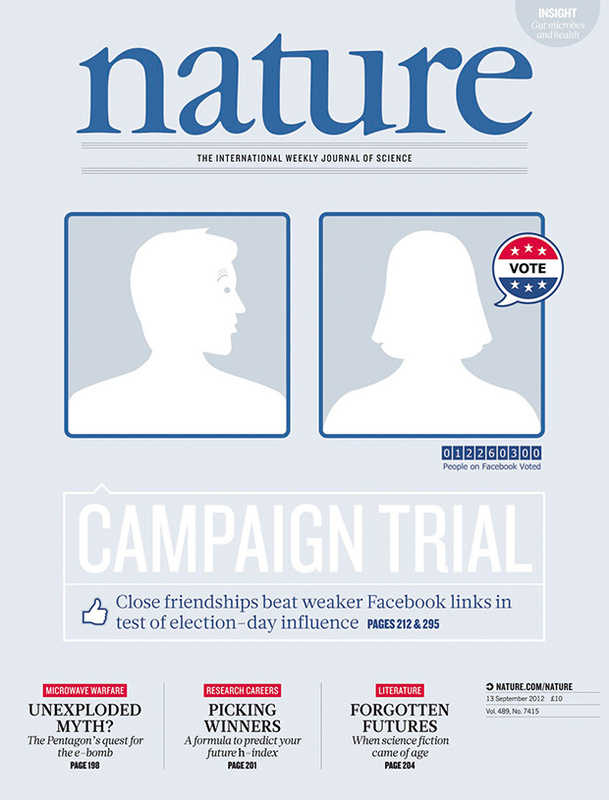 Published in Nature, the massive-scale experiment confirms that peer pressure helps get out the vote – and demonstrates that online social networks can affect important real-world behavior. According to the U.S. Census Bureau, voter participation was about 53 percent of the voting-age population for the presidential election in 2008. For the Congressional election in 2010, which this study focused on, the turnout was 37 percent. The numbers are clear: Many more people in the United States could vote than do. The study is Nature’s Sept. 13, 2012 cover. Click image for larger view. In the study, more than 60 million people on Facebook saw a social, non-partisan “get out the vote” message at the top of their news feeds on Nov. 2, 2010. The message featured a reminder that “Today is Election Day”; a clickable “I Voted” button; a link to local polling places; a counter displaying how many Facebook users had already reported voting; and up to six profile pictures of users’ own Facebook friends who had reported voting. About 600,000 people, or one percent, were randomly assigned to see a modified “informational message,” identical in all respects to the social message except for pictures of friends. An additional 600,000 served as the control group and received no Election Day message from Facebook at all. Fowler and colleagues then compared the behavior of recipients of the social message, recipients of the informational message, and those who saw nothing. 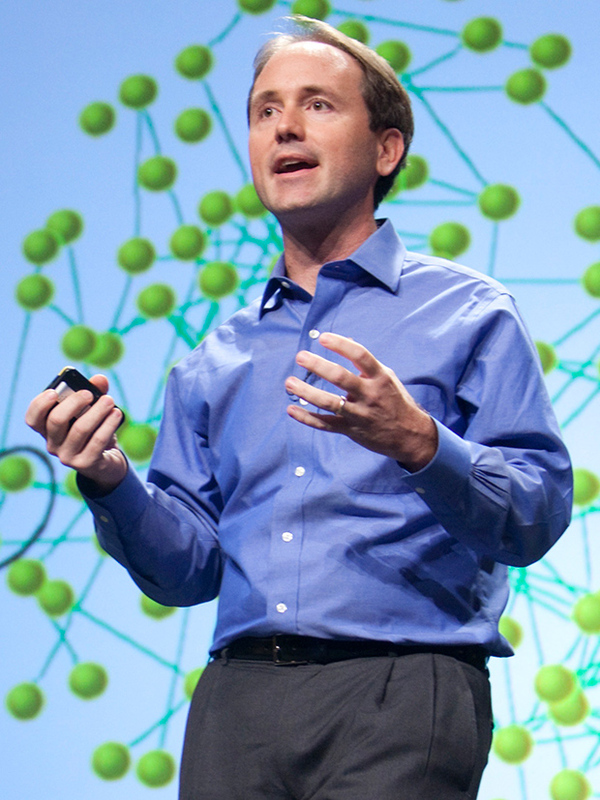 James Fowler, UC San Diego professor of political science in the Division of Social Sciences and of medical genetics in the School of Medicine. To estimate how many people actually voted, the team used publicly available voting records. In their analyses, they developed a technique that prevented Facebook from knowing which users actually voted or registered, but it allowed the researchers to compare rates of turnout between users who saw the message and users who didn’t. Sure enough, about 4 percent of those who said they had voted hadn’t. But more importantly: Rates of actual voting, the researchers discovered, were highest for the group that got the social message. 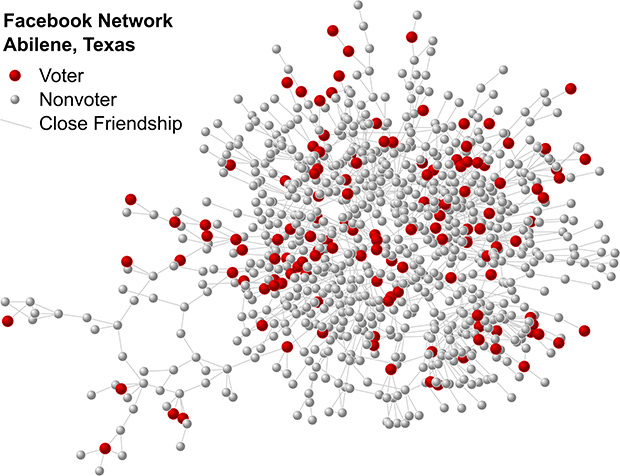 Illustrative map of part of the social network of “close friends” from Abilene, Texas, who logged in on Election Day in 2010. Click image for larger view. The researchers estimate that the direct effect of the Facebook social message on users who saw it generated an additional 60,000 votes in 2010. But the effects of the social network – of social contagion among friends – they say, yielded another 280,000 more, for a total of 340,000. In other words, Fowler said, the social network yielded an additional four voters for every one voter that was directly mobilized. Fowler and colleagues get to the total figure by comparing turnout between the friends of those who saw the social message and the friends of those who saw no message. Friends of social-message recipients, regardless of whether they were themselves recipients, were more likely to vote. The researchers also show that the message affected people at two degrees of separation: the friends of the friends of social-message recipients were also more likely to click on the “I voted” button, yielding an additional 1 million acts of political self-expression. Most of the increase in actual voting, Fowler said, was attributable not to the entire set of a user’s Facebook friends but to “close friends,” people with whom users were most likely to have a close relationship outside the online network, too. The researchers established this by asking some users about their closest friends and then measuring how often they interact on Facebook. Fowler and colleagues showed that Facebook interactions could be used to predict which Facebook friends were also close friends “in real life,” and it was these close relationships that accounted for virtually all the difference in voting. The researchers did not find any evidence of differences in effects among self-described liberals and conservatives. Research is now continuing on what kinds of messages work best for increasing voter participation and what kinds of people are most influential in the process. Although the effect of the message per friend was small, Fowler points to the advantages of scale. When you multiply a small effect across the millions of users and billions of friendships in online social networks, you quickly get to numbers that make a difference. Additional coauthors are: Robert M. Bond, Christopher J. Fariss, Jason J. Jones, Jaime E. Settle of UC San Diego and Adam D. I. Kramer and Cameron Marlow of Facebook. The study was supported in part by the James S. McDonnell Foundation and the University of Notre Dame and the John Templeton Foundation as part of the Science of Generosity Initiative.